ColorBalls Created by aekiro. This templates have specific characteristics, namely: ColorBalls is a great complete multi-platform 2D game ready to publish.It’s a challenging, brain teasing casual game.Keep the ball up in the air but make sure it goes through the matching obstacle . You can use this ColorBalls on Html5 category for android, brain, browser game, buy html5 games, color, hard, mobile game, switch and another uses. 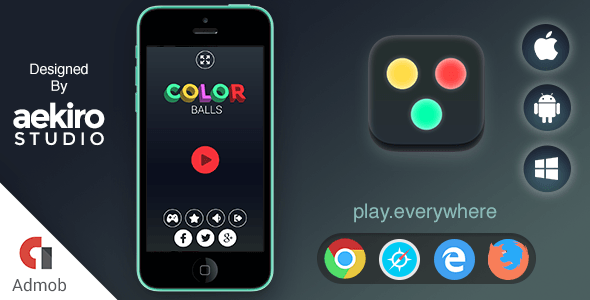 ColorBalls is a great complete multi-platform 2D game ready to publish. It’s a challenging, brain teasing casual game. Keep the ball up in the air but make sure it goes through the matching obstacle ! – This game was made with Construct 2. – This is a HTML5 Game, not a native game. Can I include my company branding and logo ? Absolutely. Our games come ready with a custom loader screen.All you have to do is place your own splash screen, logos, etc. Can I modify the source code of the game ? Yes. We provide the source code so you can have full control of the game at anytime. How many domains can I upload the game on to ? You can deploy on an unlimited domain or subdomains.